In our October edition of our Preemie Family newsletter we learned about 26-week preemies Andresito & Vicente Andrés Granados Diaz. Andresito was born at ~1.76 lb. and spent 0 days in the NICU as he passed away at birth, Vicente Andrés was born at~1.76 lb. and spent 30 days in the NICU before passing away. Read more in an update by their mother Jessica Diaz. In 2011 I had the hardest and most beautiful experience of my life. I lost my first two baby twins, as they were born too soon at 26 weeks. After being one month with one of them fighting for his life in the NICU, I sadly realized that globally, but above all in developing countries there are a lot of opportunities to improve maternal health, diminish neonatal deaths, and enhance quality of life of preemie babies, their families and the society. That is why Ilein Bolaños (my partner and mother of 2 preemies), and I decided to create a LatAm parent of preemies NGO called Con Amor Vencerás (CAV). Regularly in most of the hospitals in Mexico, parents are only allowed to visit their preemies two hours per day (one in the morning and one in the afternoon). This is mainly because Mexican medical staff do not see the parents of preemies as part of their team. Also, because in many hospitals, NICU’s rooms do not have enough spaces or infrastructure to allow parents and babies to be comfortable. But even, if you do not have enough space, the hospital most find ways to allow parents to stay as much time as possible with their babies and be part of their treatment. When I gave birth to my babies at their 26 week, I was very naive about all the high risks associated with their low gestational age. Vicente Andrés born first in the natural way, he cried and that was a good sign for the neonatologist, who took him immediately to the NICU. Unfortunately, just after he was born I had premature rupture of membranes, and the doctors decided to perform an emergency C section to take out the other baby, Andresito. 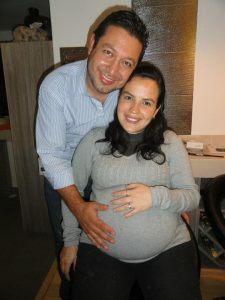 I was unconscious and my husband went with the first born baby (Vicente Andrés). As Doctors believed that Andresito (my second baby), had low chances to survive and was tiny (1.76 lbs), they simply decided not to revive him; and after 2 hours that they left him alone fighting for his life, unfortunately he died. This is the worst thing that my husband and me have passed through. Nobody even asked us if we wanted for the doctors to revive the baby, he died alone! The doctors made that decision instead of us. That is why it is crucial that all preemie babies in the world, at least have the chance to be revived, no matter their age or their conditions. I have seen, after the creation of CAV that there are a lot preemie babies who have survived and now have a happy life. Because doctors and their parents decided to fight for them and obviously as many of us know, all preemies are fighters, warriors and the best living example to prove that medicine, the strength of love and miracles could happen. That is why; I believe every preemie deserves a chance to live and to fight for all his live rights, which at least should be to be with his family and to receive all the feasible medical attention. My experience in the NICU completely change me and my husband, in terms that now I try to keep myself and my beloved ones informed in a more preventive way about all the related family healthy issues. For example, when I got pregnant for the second time, I asked a lot of preventive and alarm signs to my gynecologist, and I took extra care with my body, I ate healthy, do not go out so often, took all my vitamins, etc. My more important lesson learned is to keep always informed, to be part of all the medical decisions of your babies and that love together with medical staff patience and empathy, are the best medicine to help a parent and a baby to get through the NICU in the happiest and easier way! Editor’s Note: The Con Amor Vencerás (CAV) logo shown has the image of one of the twins’ footprints. This is the only image the Diaz family has of their twins as the doctors did not allow photographs to be taken in the NICU. Sign up for Preemie Professional FREE here. That is so sad and unfortunately so true about some of our countries. I lost my first born as well due to the hospital not doing anything for my 28 weeker in Mexico. Now I am a happy mother of 26 week old twins that are almost 5 months old and they are happy and healthy thanks to the technology and well prepared staff here in the United States. My twin boys are a true miracle and I feel so blessed. What you are doing is great. If there is anything I can do to help please count me in.